Because that's just "bad form" (borrowing from Captain Hook). We shouldn’t make claims about ourselves but instead build rapport and trust by showing that we are the sort of friend a person wants to spend time with. In this brief excerpt from session 7 of MMC5259 Customer Relationships and Effective Lead Management, Flint McGlaughlin reminds students that, in the same way, when we fail to see a webpage as a conversation with someone whom we are trying to build a trust relationship with, we can sound absurd. It's important that we value the absurd because it jars us back into reality. 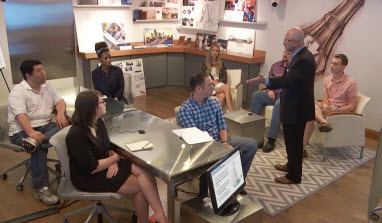 You can learn more about the customer "trust trial" at the Communicating Value and Web Conversion graduate certificate program created by the University of Florida and MECLABS Institute. 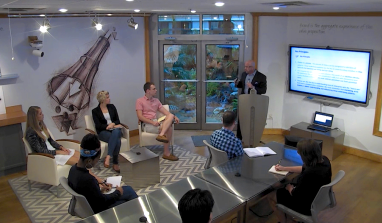 The full session aims to introduce students to the unique and unprecedented nature of the web and how it can be used as a living laboratory to study the cognitive decision process of our customers and predict their future behavior. Flint McGlaughlin: Bear down on this page and, first of all, answer a single question. What is wrong with that headline? Take a look, remember what we've been teaching, and in a single word you should be able to define the problem. Participating like this, with these mental exercises, it's a key to truly learning. It is very strategic, very intentional. So see if you can get the right answer. If you're still trying to solve for that question, go back to the Trust Trial and think about the first stage. I have said to you in the past that the marketer's job is to foster conclusions rather than to make claims. That's correct, and that's the key to understanding what we're going to learn only because it fits into a much bigger picture. It's so easy to learn key tools, insights, but not be able to pan back and understand the entire system, and today it's about that system. What does it mean to know? And if we really know the other, the prospective customer, how can we leverage that to have high impact, to win more yeses? As you think about that, look at the headline. What's wrong with this? Now this is an organization that we worked at conducting research in the past. The CEO is one of the most intelligent leaders I've ever met. He's learned from the interaction the power of what it means to truly know the customer. And so, as you look at this headline, it begins by telling me something I have to do — work, send — and then it makes a rather odd claim. We could get caught on this, because I don't know what the words "most" and "superior" mean when you combine them. Superior is superior. It's a bit redundant, but more importantly it's a claim. Now ask yourself a question. Even as a basic consumer coming to a headline like this, would that move you to say yes? "Send your press releases," that's just work. It's not what I want to accomplish. It's not actually the benefit of sending the press releases. And then it says, really it implies the “why” — because we're the most superior network. Well, again, I don't know what a "most superior network" is, but I get the essential message — we're the best. And then in case you're not really convinced, we're going to use a rhetorical technique. We're going to do an ellipsis followed by a … "by far." Now part of my job here is to point out the absurd because we're so used to experiencing poor quality marketing that sometimes we lose scale. We forget to see it in the context of a conversation with a friend, and we fail to see how bad it truly is. Let's suppose I was meeting someone today for the first time and I wanted to, I don't know, create a relationship, a friendship. What would I experience in terms of result if I were to follow this approach? Spend your time with me, the most superior friend … by far. It's ridiculous. Kierkegaard reminds us of the absurd in his thesis, "The Concept of Irony." It's important that we value the absurd because it jars us back into reality. I mean this graciously, but this isn't just bad, I think the official scientific term is "wretched." It's a wretched headline, and it's only supported by yet another on the left side — "The most ways to reach your audience." Uh-oh, here we go again — "by far." So if the absurdity of this is sinking in, then it should stimulate a much more important observation and question. How could we improve this by applying the Trust Trial? 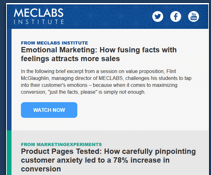 Elevate your marketing career by discovering why people say "yes"
Get an overview of the MECLABS and UF graduate certificate program that helps marketers better communicate the value of their products and increase online conversion.